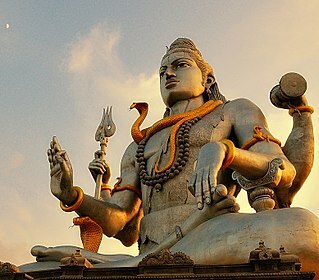 Shaivism is one of the major traditions within Hinduism that reveres Shiva as the Supreme Being. The followers of Shaivism are called "Shaivites" or "Saivites". It is one of the largest sects that believe Shiva — worshipped as a creator and destroyer of worlds — is the supreme god over all. The Shaiva have many sub-traditions, ranging from devotional dualistic theism such as Shaiva Siddhanta to yoga-oriented monistic non-theism such as Kashmiri Shaivism. It considers both the Vedas and the Agama texts as important sources of theology. The origin of Shaivism may be traced to the conception of Rudra in the Rig Veda. The Kadambas of Goa were a dynasty during the Late Classical period on the Indian subcontinent, who ruled Goa from the 10th to the 14th century CE. They took over the territories of the Silaharas and ruled them at first from Chandor, later making Gopakapattana their capital. The temple is built in the Kadamba style from basalt, carried across the mountains from the Deccan plateau and carved craftsmen. It is considered to be the only specimen of Kadamba architecture in basalt stone preserved and available in Goa. The temple survived invasions and the Goa Inquisition due to its remote location in a clearing deep in the forest at the foot of the Western Ghats which surround the site. Kadamba architecture was a style of temple architecture founded by Mayurasharma in the 4th century AD in Karnataka, India Kadambas created new style of architecture which was the basis of the Hoysalas style of architecture, developed original school of sculpture, was the forerunner of series of South Indian sculptors. Many temples at Aihole, Badami and Hampi are built in Kadamba architectural style. Aihole, also referred to as Aivalli, Ahivolal or Aryapura, is a historic site of ancient and medieval era Buddhist, Hindu and Jain monuments in north Karnataka (India) dated from the fourth century through the twelfth century CE. Located around an eponymous small village surrounded by farmlands and sandstone hills, Aihole is a major archaeological site featuring over one hundred and twenty stone and cave temples from this period, spread along the Malaprabha river valley, in Bagalakote district. The king cobra, also known as the hamadryad, is a venomous snake species in the family Elapidae, endemic to forests from India through Southeast Asia. It is threatened by habitat destruction and has been listed as Vulnerable on the IUCN Red List since 2010. It is the world's longest venomous snake. Adult king cobras are 3.18 to 4 m long. The longest known individual measured 5.85 m (19.2 ft). Despite the word "cobra" in its common name, this species does not belong to genus Naja but is the sole member of its own. It preys chiefly on other snakes and occasionally on some other vertebrates, such as lizards and rodents. It is a dangerous snake that has a fearsome reputation in its range, although it typically avoids confrontation with humans when possible. The king cobra is a prominent symbol in the mythology and folk traditions of India, Sri Lanka and Myanmar. It is the national reptile of India. Garbhagriha is the sanctum sanctorum, the innermost sanctum of a Hindu temple where resides the murti of the primary deity of the temple. Literally the word means "womb chamber", from the Sanskrit words garbha for womb and griha for house. Generally in Hinduism only 'priests' (pujari) are allowed to enter this chamber. Although the term is often associated with Hindu temples, it is also found in Jain and Buddhist temples. Antarala is a small antechamber or foyer between the garbhagriha (shrine) and the mandapa, more typical of north Indian temples. Nandi is the gate-guardian deity of Kailasa, the abode of Lord Shiva. He is usually depicted as a bull, which also serves as the mount to Shiva. According to Saivite siddhantic tradition, he is considered as the chief guru of eight disciples of Nandinatha Sampradaya, namely, Sanaka, Sanatana, Sanandana, Sanatkumara, Tirumular, Vyagrapada, Patanjali, and Sivayoga Muni, who were sent in eight different directions, to spread the wisdom of Shaivism. Brahma is a creator god in Hinduism. He has four faces. Brahma is also known as Svayambhu (self-born) or creative aspect of Vishnu, Vāgīśa, and the creator of the four Vedas, one from each of his mouths. Brahma is consort of Saraswati and he is father of Four Kumaras, Narada, and Daksha. The temple is at 15°26′20″N74°15′8″E﻿ / ﻿15.43889°N 74.25222°E﻿ / 15.43889; 74.25222 near a small village called Tambdi Surla located 13 kilometres (8.1 mi) east of Bolcornem village, in the north east region of the Bhagwan Mahaveer Sanctuary and Mollem National Park. HDR image of carvings on the ceiling of Mahadev Temple. Pattadakal, also called Paṭṭadakallu or Raktapura, is a complex of 7th and 8th century CE Hindu and Jain temples in northern Karnataka (India). Located on the west bank of the Malaprabha River in Bagalakote district, this UNESCO World Heritage site is 14 miles (23 km) from Badami and about 6 miles (9.7 km) from Aihole, both of which are historically significant centres of Chalukya monuments. The monument is a protected site under Indian law and is managed by the Archaeological Survey of India (ASI). The Pataleshwar Cave Temple is a rock-cut cave temple, carved out in the 8th century in the Rashtrakuta period. It is located in what is now Pune, in the state of Maharashtra, India. It was originally situated outside the town, but the city limits have expanded so that it is now located on the downtown Jangli Maharaj Road. It has been declared as a protected monument by the government. Trikuteshwara temple is a Hindu temple dedicated to Shiva. The carved temple is in the town of Gadag, 50 km southeast of Hubli-Dharwad, in Karnataka, India. It is dedicated to Shiva and has three lingas mounted on the same stone. There is a shrine dedicated to Saraswathi in this temple and it has carved columns. Prabhas Patan, also known as Somnath Patan or Prabhas Ksheta, historically named Dev Patan, is a town situated near Veraval, Gir Somnath district in Saurashtra region of Gujarat, India. It is located about 7 km. from Veraval. Somnath temple, a place of pilgrimage due to its importance as Jyotirlinga site dedicated to Shiva, is located here. The Kandariya Mahadeva Temple, meaning "the Great God of the Cave", is the largest and most ornate Hindu temple in the medieval temple group found at Khajuraho in Madhya Pradesh, India. It is considered one of the best examples of temples preserved from the medieval period in India. The Saptakoteshwar temple at Narve, Goa, India is considered to be one of the six great sites of temples of Lord Shiva in the Konkan area. The Baroli Temples Complex, also known as the Badoli temples, is located in Baroli village in Rawatbhata town in Chittorgarh district in Rajasthan, India. The complex of eight temples is situated within a walled enclosure; an additional temple is about 1 kilometre (0.62 mi) away. They are built in the Gurjar Pratihar style of temple architecture dated to the tenth century A.D. All nine temples are under the control of the Archaeological Survey of India for conservation and protection. A well known art critic characterised "the creations of Badoli as the most perfect of their age that he had encountered within that part of the country and, in their own peculiar style." Mandapa in Indian architecture is a pillared outdoor hall or pavilion for public rituals. Bhagwan Mahaveer Sanctuary and Mollem National Park is a 240 square kilometres (93 sq mi) protected area located in the Western Ghats of South India, in Sanguem taluk, Goa along the eastern border with Karnataka. The area is situated near the town of Molem, 57 kilometres (35 mi) east of Panaji, the state capital of Goa. National Highway 4A divides it into two parts and the Mormugao - Londa railway line passes through the area. It is located between 15°15"30' to 15°29"30' N and 74°10"15' to 74°20"15' E. It contains several important temples dating to the Kadamba Dynasty, and Dudhsagar Falls. The parkland is also home to a community of nomadic buffalo herders known as the Dhangar. A Goan temple is known as a dēvūḷ (देवूळ) or sansthān (संस्थान) in the Konkani language. These temples were once the centres of villages, cities, and all the other social, cultural and economic gatherings in Goa. These were known as grāmasansthās (ग्रामसंस्था) in Konkani. Kamala Narayana Temple is at Degaon in Belgaum District, Karnataka, India. The temple was built by the Kadamba dynasty. Kamal Narayan Temple was constructed by Tippoja, the Chief Architect of Kamala Devi, the Queen of the Kadamba king Sivachitta Permadi in the 12th century. This temple built in 1174. A.D. The principal deity is Lord Narayana. Chandor is a village in South Goa district, Salcete sub-district, in the Indian state of Goa. on the banks of the river Kushavati, 10 km east from Margao. The antiquity of Architecture of Karnataka can be traced to its southern Neolithic and early Iron Age, Having witnessed the architectural ideological and utilitarian transformation from shelter- ritual- religion. Here the nomenclature ‘Architecture’ is as old as c.2000 B.C.E. The upper or late Neolithic people in order to make their shelters, they constructed huts made of wattle and doab, that were buttressed by stone boulders, presumably having conical roof resting on the bamboo or wooden posts into red murram or paved granite chips as revealed in archaeological excavations in sites like Brhamagiri, Sanganakallu, Tekkalakota, Piklihal. Megaliths are the dominant archaeological evidence of the early Iron Age. There are more than 2000 early Iron Age burial sites on record, who laid the foundation for a high non perishable architecture in the form of various distinct architectural styles of stone built burials, which are ritualistic in its character. The active religious architecture is evident 345 with that of the Kadamba Dynasty. Karnataka is a state in the southern part of India originally known as the State of Mysore. Over the centuries, architectural monuments within the region displayed a diversity of influences, often relaying much about the artistic trends of the rulers of twelve different dynasties. Its architecture ranges dramatically from majestic monolith, such as the Gomateshwara, to Hindu and Jain places of worship, ruins of ancient cities, mausoleums and palaces of different architectural hue. Mysore Kingdom (Wodeyar) rule has also given an architectural master structure in the St. Philomena's Church at Mysore which was completed in 1956, in addition to many Dravidian style architectural temples. Two of the monuments are listed under the UNESCO World Heritage List of 22 cultural monuments in India. Styles of Indo-Saracenic, Renaissance, Corinthian, Hindu, Indo-Greek and Indo-British style palaces were built in Mysore, the city of palaces. Sikh architecture at Bidar (1512) and also in Bangalore in 1956 can also be cited as having an impact on the architectural composition of the state. The Shri Mallikarjuna temple dedicated to Lord Mallikarjun, an incarnation of Lord Shiva is situated in the Sristhal village which is 7 km northeast of Chaudi in Canacona taluk in the South Goa district of Goa, India. The shrine is known to be one of the oldest in Goa and is situated amidst beautiful natural surroundings in a valley completely surrounded by mountains. The temple is believed to be constructed during the middle of the 16th century, as per the writing on a plaque near the temple dome, by ancestors of the Kshatriya samaj. It was refurbished in the year 1778. The main deity of the temple is referred to as Advat Sinhasanadheeshwara Mahapati by his devotees. His consort is referred to as Devati. Kopeshwar Temple is at Khidrapur, Kolhapur district, Maharashtra. It is at the border of Maharashtra and Karnataka It is also accessible from Sangli as well. It was built in the 12th century by Shilahara king Gandaraditya between 1109 and 1178 CE. It is dedicated to Lord Shiva. It is to the east of Kolhapur, ancient & artistic on the bank of the Krishna river. The Achaleshwar Mahadev Temple is a Shiva temple situated just outside the Achalgarh Fort, located in the Abu Road tehsil of Sirohi district, in the western Indian state of Rajasthan. The temple is believed to have been constructed sometime in the 9th century AD, and by the Paramara dynasty, which is also credited with having constructed the original structure of the Achalgarh Fort, later reconstructed, renovated and named as Achalgarh by Maharana Kumbha in 1452 CE. Kollam Rameswaram Mahadeva Temple is located in the city of Kollam City in Kollam district. The presiding deity of the temple is Lord Rameswara facing west. It is believed that Kollam Rameswaram Mahadeva Temple is one of the 108 Shiva temples of Kerala and is installed by sage Parasurama dedicated to Lord Shiva It is one of the two Rameswaram temples in 108 Shivalaya Sothram. The Amaravila Rameshwaram Sri Mahadeva Temple is the second Rameshwaram Temple. The temple is located in the village of Amaravila in Thiruvananthapuram District. Wikimedia Commons has media related to Mahadev Temple, Tambdi Surla . ↑ Hall, Maurice (1995). Window on Goa: A History and Guide. Quiller. p. 214. ISBN 9781870948982.